Rob Kearney says Ireland have no problems with Johnny Sexton venting his frustrations about the patchy form of Joe Schmidt's men. The fly-half came under fire following an expletive-laden rant when departing the field late on in Ireland's sluggish 26-16 win in Italy. However, team-mate Kearney is adamant Ireland would not change the world player of the year. "That's Johnny, isn't it? We're a little bit used to it," said Kearney. "We all get frustrated and we all show our frustration in different ways." When quizzed on how often he would cop a harsh word from the demanding British and Irish Lion, Kearney replied: "Weekly. Johnny understands the game very well and is very clear in how he wants to play it. "That's his way of communicating it." 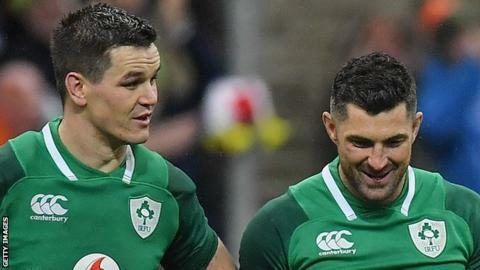 Kearney and Sexton have linked up with Leinster and Ireland for the bulk of their careers and both are expected to start Sunday's Six Nations game against France in Dublin. Ireland's defence of their 2018 Six Nations title and Grand Slam faltered from the start, with their 32-20 Dublin loss to England a wake-up call after a stellar 12 months. Patchy victories in Scotland and against Italy in Rome have followed, leading to coach Schmidt's admission that Sexton and scrum-half Conor Murray have been angry and frustrated with their form. Schmidt's men may have to do without Robbie Henshaw this weekend though, with the Leinster star a doubt having failed to recover from a dead leg. Henshaw has not featured since that opening-round England defeat, where he was deployed at full-back for just the second time in his Test career. Fly-half Joey Carbery is still inching back to full fitness after hamstring trouble, while flanker Dan Leavy continues to nurse an ankle problem.